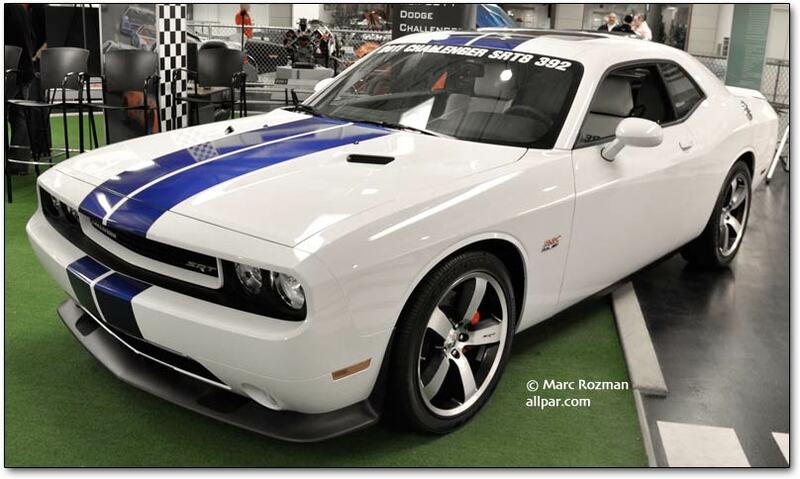 The 2011 Dodge Challenger has electric power steering and new engines. Key improvements include better brake feel, retuned shocks and bushings for better cornering and feel, new and improved optional performance tires, and a revised steering wheel with on-wheel controls. The Pentastar V6 adds 55 hp to the outgoing 3.5 V6, with 305 horsepower and 268 lb-ft of torque; yet, it should achieve 27 mpg on the highway [We had predicted 26-28]. The standard Hemi V8 has also been bumped up, to 379 hp and 410 lb-ft (manual); it now gets 17 mpg city, 25 highway (automatic). The 392 Hemi (6.4 liters) is rated at 470 hp with 470 lb-ft. Both V8s shut off four cylinders when not needed (except with manual transmissions). 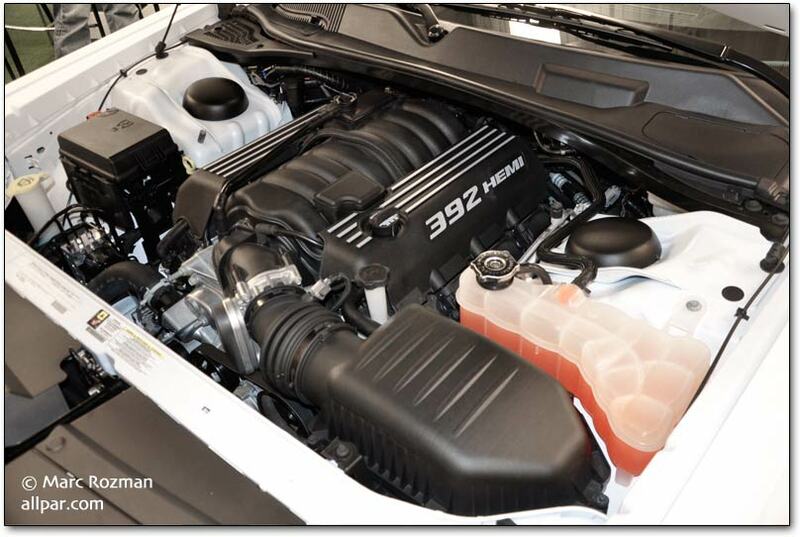 The Challenger SE’s 13 horsepower increase over other Pentastar engines is due to “a more aggressively designed intake air system” which increased airflow from 214 to 220 g/s. The cam is identical. Dodge Challenger R/T and R/T Classic have the 379 hp Hemi, 20-inch chrome wheels, and optional six-speed manual; the Classic adds retro 20-inch chrome wheels, functional hood scoop, retro side stripes, and HID headlamps. R/T starts at $30,495; Plus package adds $1,500, and Classic adds $3,300. Dodge Challenger SRT8 adds the 470 horsepower engine, with 470 lb-ft of torque; again, there is an optional six-speed manual transmission. In the U.S., it starts at $43,380, plus any gas guzzler taxes. JackRatchett wrote that the styling remains almost identical, except the lower opening was flipped upside down and made taller; the Ram emblem has been removed; the door handles will be the same as those on the Charger; and there will be a wagon-style Dodge Magnum switch to pop the trunk open. Dual exhaust with bright tips, bright fuel filler door, and standard 18-inch aluminum wheels are featured on the 2012 model. 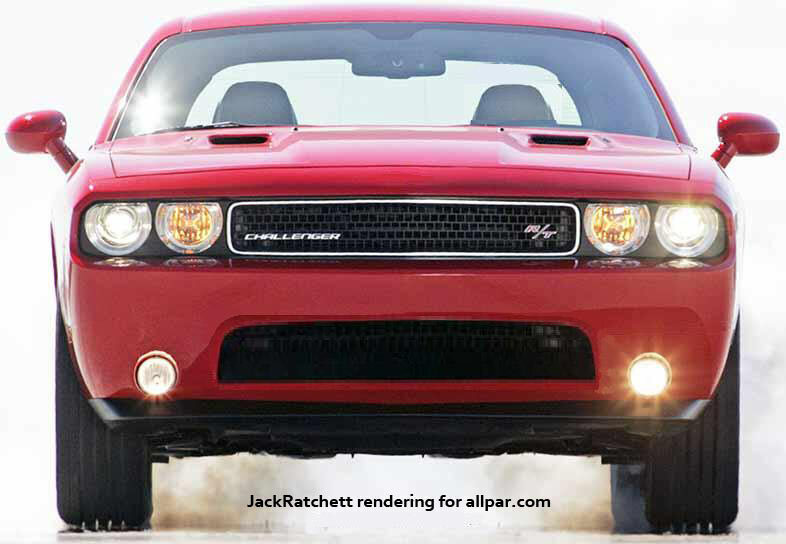 JackRatchett also wrote that the 6.4 SRT8 Challenger will probably have a wrap-around front spoiler incorporating the black flap at the front edge of the wheel well. It was described as having an Abe Lincoln beard and side burns, and one with the hood open appeared to have a blacked out intake manifold. The aluminum manifold will be replaced with a plastic one on the 6.4; which will keep the traditional hydraulic steering pump even as the other Challengers go to electric steering. (Electric steering reduces the number of moving parts, eliminates fluid leaks, and allows for easier integration of start/stop and hybrid systems). The interior underwent major upgrades, and the usual electronics updates were expected: moving to Garmin navigation, adding whatever safety and A/V options are de rigeur, etc. Mainly, the dashboard should be dramatically upgraded and materials may be improved. For 2012, a leather-wrapped steering wheel and shift knob, six-way driver seat with four way lumbar adjust, and passenger seat with EZ Entry Function were added to the interior. A revised suspension geometry in 2011 was incorporated for improved balance, cornering and steering responsiveness. Electro-hydraulic power steering was added to improve ride and handling. For safety, Electronic Stability Control with brake assist, all-speed traction control, rain brake support, hill start assist, and ready alert braking is included in 2012. 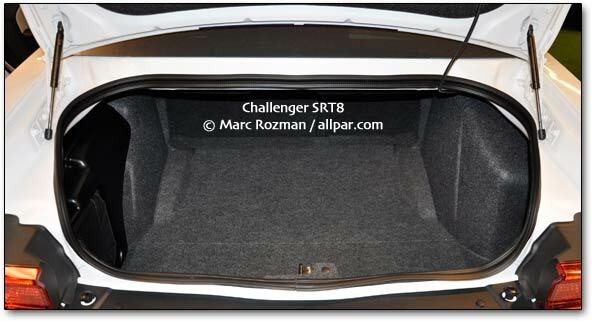 The Challenger R/T Track Pak is expected to continue; it includes a six-speed manual transmission, Hill Start Assist, anti-spin differential (3.73 w/18-inch, 3.92 w/20-inch wheels), and ESP full-off switch. The Canadian SXT includes the following standard equipment: 3.6L Pentastar V6, 5-speed automatic, 18-inch aluminum wheels, premium cloth seating, Uconnect hands free phone, Electronic Stability Control, dual-zone automatic temperature control, Keyless Enter-N-Go, dual rear exhaust with bright tips and bright fuel filler door, power 6-way driver’s seat with power four-way lumbar, power exterior mirrors, leather-wrapped tilt/telescoping steering wheel with cruise and audio control, six-speaker media center with auxiliary jack, rearview auto-dimming mirror with microphone, active front head restraints, six standard air bags, and four-wheel disc antilock brakes. Satellite radio and sound group are optional on the SXT. The SXT Plus includes Nappa leather-faced seats, fog lamps and automatic headlamps, heated front seats, six Boston Acoustic speakers, Sirius satellite radio, and a sun visor with illuminated vanity mirrors. The Super Sport Group and power sunroof are available as options on the SXT Plus. Lexus, Mercedes via Automotive News. Prices include shipping. For 2012, The R/T includes 20-inch chrome clad wheel aluminum wheels, power heated exterior mirrors, performance steering and suspension, rear body color spoiler, and mini carbon accents. The R/T Classic adds 20-inch polished aluminum wheels, HID headlamps, dual R/T side stripes, functional hood scoop, and Challenger script badge. Dual Red R/T side stripes and Dual White R/T side stripes are available on the R/T Classic. The 2012 SRT8 includes Nappa leather-faced seats with suede perforated inserts, 20-inch forged aluminum wheels, two-mode active damping suspension, media center 430 with 6.5-inch touch screen, antispin rear differential, bright pedals, heated steering wheel, dual black center stripes, severe duty engine cooling and engine oil cooler, park-sense rear park assist, universal garage door opener, temperature and compass gauge, security alarm, and 392 badging. Dual Silver center stripes and Dual Grey center stripes are optional on the SRT8. Antispin rear differential, electronics convenience group, HID headlamps, media center 730N with enhanced navigation, Mopar Exterior Appearance Group, power sunroof, Sound Group II, and Super Track Pak are available as options on the R/T, R/T Classic, and the SRT8. 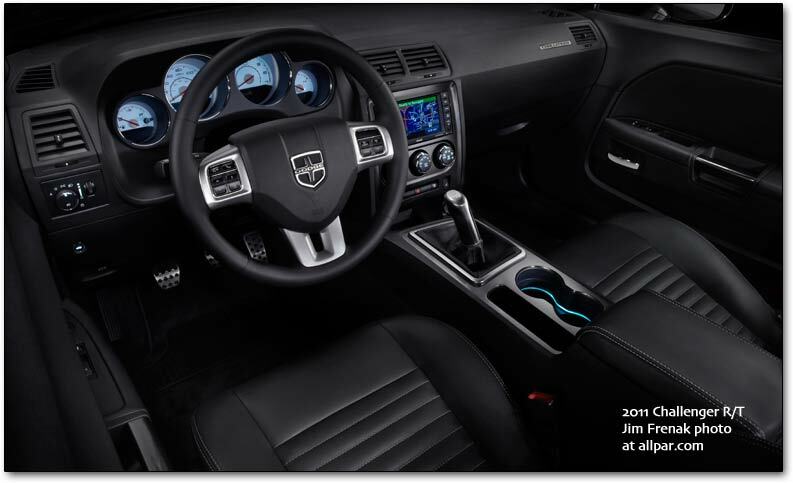 The Mopar Interior Appearance Group is available as an option on all models. The 2011 Dodge Challenger SE’s mileage and power rose with the Pentastar V6 engines and the new 6.4 liter V8 with cylinder deactivation. The Challenger SRT8 was the first car to get the new 392 cubic inch engine. The 2012 Jeep Grand CherokeeSRT8, set for a summer 2011 launch, runs from 0-60 mph in 4.8 seconds, screams from 0-100-0 mph in the mid-16 second range, covers the quarter mile in the mid-13 second range, has a top speed of around 155 mph, and brakes from 60-0 mph in 116 feet. In person, the Grand Cherokee is sleek and muscular; its power is not obvious, except when the engine is on and rumbling, but it does have a look of restrained power, or perhaps that’s just perception, knowing what it is. The car looks smaller than it is, and sportier than the stock Grand Cherokee. It’s not just the dropped suspension, it’s also the body-colored flares and other details. Powering the 2012 Jeep Grand Cherokee SRT8 is a new 6.4-liter HEMI® V-8 with Fuel Saver Technology that delivers an estimated 470 horsepower and 465 lb.-ft. of torque – an improvement of 50 horsepower and 45 lb.-ft. torque over the 6.1-liter HEMI V-8 it replaces. An active intake manifold and high-lift camshaft with cam phasing delivers maximum low-end torque while optimizing high-end power across a wider and improved rpm band. 90% of peak torque is available between 2,800 and 6,000 rpm. A new active valve exhaust system allows four-cylinder operation to engage over a wider rpm range, for better mileage (estimated at 13% on the highway) and a range of around 450 miles on one tank of gas. Standard steering wheel mounted paddle shifters join the AutoStick on the floor. Both use the same automatic transmission as prior SRT8s, and give the driver the ability to shift while the transmission controller calibration prevents situations that might over rev the engine. Fully adaptive electronic control of all shifting makes the powertrain more responsive while minimizing harshness. The best handling Jeep vehicle ever – capable of .90 g on the skid pad – features a new SRT-tuned, adaptive damping suspension managed by the new Jeep Selec-Track system that interacts with several different systems (stability control, adaptive damping, transmission shift strategy, transfer case torque proportioning, Electronic Limited Slip Differential performance, throttle control and cylinder de-activation). Drivers can manually choose between five dynamic modes: Auto, Sport, Towing, Track (extra firm), and Snow. The performance-tuned, fully-hydraulic steering system is improved with a new, heavy-duty pump and pump cooler. Revised gearing gives drivers more direct feel and on-center response. New split 5-spoke, 20-inch forged aluminum wheels ride on P295/45ZR20 Pirelli PZero run-flat tires (standard All-season or available Three-season). Rounding out the capability of the 2012 Jeep Grand Cherokee SRT8 is a trailer tow rating of 5,000 lbs. Stopping distance performance of 116 feet from 60-0 mph is made possible by new red-painted, Brembo 6-piston (front) and 4-piston (rear) calipers, and vented rotors at all four corners measuring 15-inches (front) and 13.8-inches (rear). The main down-side to the high performance tires and brakes is the high cost of replacing them; like many high-performance cars, the Grand Cherokee SRT8 uses quite expensive tires (those Pirellis will run you $1,968 at Tire Rack), and requires that you replace those big vented rotors when the pads wear down. The 2012 Grand Cherokee SRT8 was lowered one inch from the standard model, and has SRT-exclusive body-color wheel flares and side sill cladding. A one-piece front fascia contains new LED multi-function daytime running lamps; a body-colored front grille with a black screen background and chrome bezel inserts adds to the aggressive look. The integrated lower front grille is painted in gloss black and a newly designed underbody belly pan features integrated brake ducting to improve cooling and fade performance. A new hood with functional dual black heat extractors increases engine cooling. At the rear, a new liftgate spoiler reduces drag and improves downforce. A one-piece rear fascia includes a separate air diffuser along with an available trailer receiver and access cover. 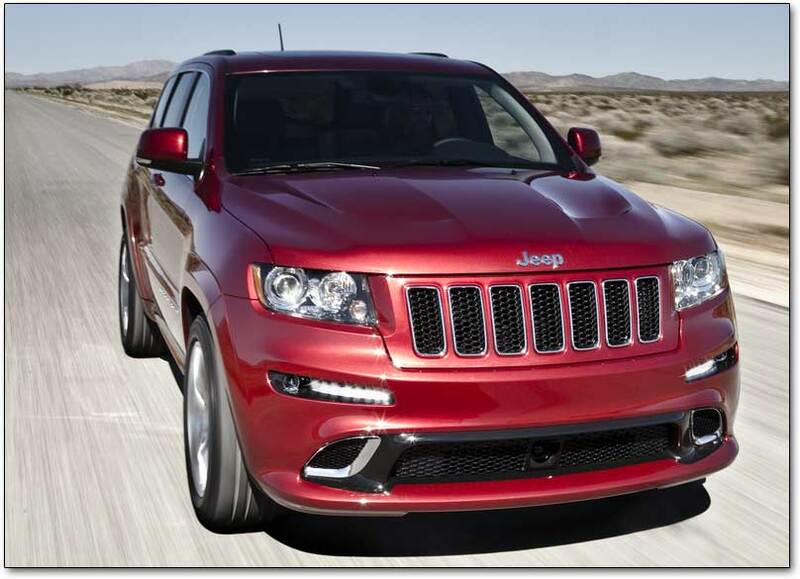 New for the 2012 version of the Grand Cherokee SRT8 is the dual-sport exhaust system featuring 4-inch exhaust tips. A new, leather-wrapped, heated steering wheel features a unique race-inspired rim section with a flattened bottom surface. Standard paddle-shift controls flank both sides of the new contoured palm rests while all audio and Electronic Vehicle Information Center (EVIC) controls are accessible from the horizontal spokes on the steering wheel. A power tilt and telescoping steering column also is standard. Performance Pages are new for 2012 and show instant feedback on steering input measurements, horsepower, torque, 0-60 mph time, 60-0 mph braking distance, g-forces, and one-eighth mile and quarter-mile times, along with expanded engine information. New Nappa leather and suede seats, with sculpted bolsters and adjustable headrests, provide comfort and “grip” and have embroidered SRT logos and contrast stitching accent on the two front seats. Heated (front and rear) and ventilated (front) seats are standard. Carbon fiber accents are integrated into the panels and bright brake and pedal pads add to the look. The optional Luxury Group package adds premium leather to the door trim panels, instrument panel and center console along with a power liftgate, adaptive cruise control, Forward Collision Warning and Blind-spot Monitoring. New for 2012 is the available 825-watt, 19-speaker premium SRT performance audio surround-sound system from Harman Kardon® that includes a 10-inch subwoofer for the ultimate in sound quality. The system uses GreenEdge® technology to dramatically increase the efficiency of its speakers and amplifier, performing like a far more powerful unit. The 2012 Jeep Grand Cherokee SRT8 starts at $55,295 including destination. Chrysler said they would produce 3,800 of the 2012 models, though there is some indication that the figure is for the US only, and that additional cars would be made for Canada (1,200) and possibly other markets. The editors of Autoweek have named the 2013 Dodge Dart the “Most Significant Vehicle” of the auto show. “The Dart gives Dodge a highly competitive entry in the crucial small sedan segment where it hasn’t been a player since the middle of the last decade,” Gritzinger added. For the latest on the Dodge Dart, visit Dart-Mouth.com. Six Chrysler Group models were awarded Consumer Guide’s prestigious “Best Buys” for the 2012 model year; three more were selected as “Recommended Picks” in the 2012 list. A “Best Buy” rating signifies that a vehicle is ranked at the top of its class and is strongly approved by the editors. “Best Buy” vehicles represent the finest balance of attributes and price within their classes, and they are the best choices for most consumers. Consumer Guide’s “Recommended Picks” feature vehicles that, though not ranked at the very top of their category, are still worth strong consideration by consumers for their unique combination of attributes and value. The 2012 Chrysler Town & Country was named the Detroit News Readers’ Choice “Best Family Hauler” for the seventh consecutive year. A panel of consumer-minded Detroit News readers-turned-judges — rather than industry professionals — selected the 2012 Chrysler Town & Country as the best family vehicle at the 2012 North American International Auto Show. The 2013 Dodge Dart is a compact car with two parents, Chrysler and Fiat. Dodge took the Alfa Romeo Giulietta, a highly regarded, upper-market hatchback, widened, lengthened, and re-skinned it as a sedan, replaced the driver-facing systems with Chrysler ones, retuned the suspension, and put in their own engines. The result is a reasonably priced, quiet, and sporty car with a good interior space, numerous features, a flashy dashboard, and a good balance of economy and acceleration. While quality and durability will not be known for years to come, both were definite priorities from the start of the program through to production. Compared with other cars in its class, the Dart has the longest wheelbase, front track, length, width, and greenhouse “footprint.” Dart also has the “most aggressive tumblehome,” according to Dodge. The 2013 Dodge Dart will fulfill the basic mission of the original: to be a relatively upmarket compact car, selling at a small premium but delivering a better driver experience than its competitors. It would fulfill that mission even without the numerous “not normal on compact cars” features. Dodge Dart SE will have a base price of $16,000. The SE does not include the fancy 7” configurable display, the 8.4” touch screen, or the LED taillights, all of which will be on the Limited and R/T; they may be options on the SXT and Rallye (the Rallye at the Detroit Auto Show had all these features). The Charger-inspired, full-width tail-lamp design accentuates the Dart’s width, using 152 indirectly glowing LEDs through an internal lens that creates a fractal glass appearance; these taillamps will be available on most Darts but not SE. Both front and rear of the car are very round with virtually no corners. Up front, an active shutter system directs air around the car when extra engine cooling is not needed, increasing aerodynamics. The new Dart car is, as Allpar forum member ChrycoFan predicted, around a foot longer and two inches wider than the Giulietta hatch. It is being made in the United States, with full production starting in April 2012 (delayed from January), and will finally fill in a gap left by the Neon, which was also made in the Belvedere plant. 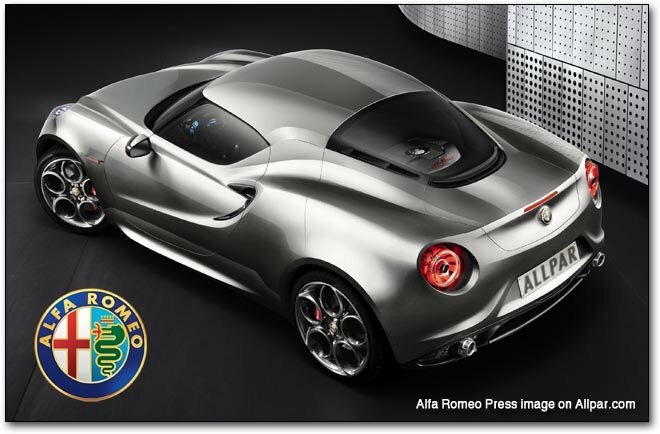 The same basic architecture will spawn at least one crossover and probably a hatchback. Why name the car “Dodge Dart?” According to Reid Bigland, CEO of Dodge, Anyone that we spoke to that was under the age of 35, we showed them pictures of the 2013 Dart with the aggressive aero, the look, the sportiness, and asked them which names they thought fit best. Dart was the overwhelming bulls-eye. These people weren’t very familiar with the 1960-1976 Dart. They were just looking at Dart for matching the design and the aero of the current car. Then on a demographic of 45 and older, there was a lot of affiliation with name Dart. The affiliation with the name Dart, the original, was very positive. The 2013 Dart uses Chrysler and Fiat engines (at 160 and 184 hp), with rumored optional all wheel drive coming; it has MacPherson struts up front, and a bilink suspension in back, both in aluminum cradles. The rumored ZF nine-speed automatic might be a late arrival; the Dart will debut with a Fiat six-speed dual-clutch automated-manual transmission, a manual version of that transmission, and a “PowerTech” six speed which is sourced from Hyundai. The reliable source oh2o wrote that the new Dodge Dart will be well equipped. SE (base) will get 16 inch wheels, and SXT and Limited going to 17” wheels. There will be a Rallye option for the SXT and, in total, six different wheel options along with the three engines and three transmissions. This has been confirmed. Rain sensing wipers appear to be another option, albeit unannounced, along with remote start (which can include turning on the heated seats and heated steering wheel). The voice recognition system allows the driver to choose between brief and detailed responses, a boon to the impatient. (The fancy dash and tail-lights both start as options on SXT). oh2o wrote, accurately, that a high priority was placed on aerodynamics, with underbody covers and active grille shutters. Dodge described the many steps taken to increase aerodynamic efficiency, including over 600 hours in the wind tunnel; cutting the drag coefficient (which was not released) helps increase gas mileage and effective highway power, and cuts wind noise. According to PhantomSpazz, an Eco model, with 40 mpg, is slated for late arrival; he also said that base pricing would not be far above the Fiat 500, which starts at $16,000. He was right about the pricing; so the Eco may be on its way. It will reportedly be the longest, widest, and tallest car in its class, and the interior will be quieter than the very-quiet Chevrolet Cruze. The new raised chrome Dodge badge uses the red twin-stripe logo. The R/T version, we’re told, will handle like a go-kart, despite the car’s size and weight. The Dart’s headlamps are projector versions while tail lamps are light-emitting diodes (LED) for compressed, sleeker and wider looking graphic shapes. Glossy Piano Black paint-in-mold finishes, versus matte or mold-in-color (MIC) Black, is used on all models but is most predominant on the Rallye and R/T models. Dodge’s “Hyper Black” finish is exclusive to performance models, such as the R/T and on the Rallye and R/T wheels. The 2013 Dodge Dart was built with 68% high-strength steel; it has ten standard airbags, unsurpassed in the segment. The 2013 Dodge Dart is the only car in its class to offer blind spot monitoring and rear cross path detection. See Dodge Dart quality and safety. The Dart will be built in Belvidere, Illinois; the cost for upgrading the plant, including adding new machinery and tooling, was $600 million. There will be no 2012 Dodge Dart (or Dodge Dart 2012 if you prefer) — production starts in 2012, but the car officially starts with the new Dodge Dart 2013.